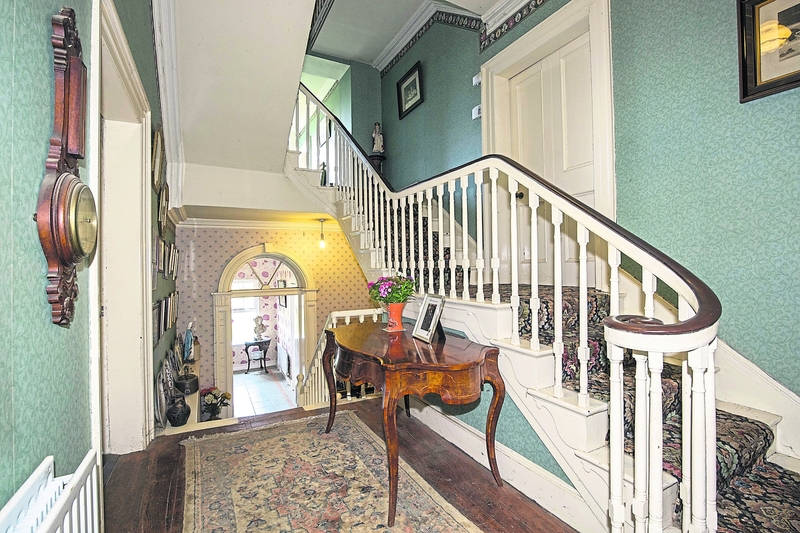 A spectacular 18th century home set on extensive lands is on the market in Offaly. Situated just outside the town of Portarlington, Cloneyhurke House was built approximately 250 years ago and is in a private setting with superb railed avenue leading to the residence, making for an impressive introduction to the property. The mature trees surrounding the house set the scene, with the residence sitting in the heart of the lands. One can access this wonderful residence through the main entrance with its decorative cast iron double gates, flanked by railings on a limestone plinth wall and terminating in limestone piers, or from the agricultural entrance that leads directly into the farm. The property is entered by a granite staircase at the front door which leads into an impressive entrance hall with wooden flooring, high ceilings and feature staircase. To both sides of the hall are two formal rooms that have wooden flooring and marble fireplaces, with the dining room to the left having dual aspect allowing for plenty of light and magnificent views over the surrounding countryside. Following on through the entrance hall is the lounge replicating the same wonderful features as the dining room. A family bathroom is located to the rear of the residence. A few steps up the stairs on the return is the first guest bedroom with high ceilings, fireplace and views over the courtyard. There is a single bedroom to the rear that would also be suitablefor games room or study. On the first floor, there are four double bedrooms with a single room to the front. All the rooms are complete with high ceilings, wooden floors and fireplaces. The lower ground floor is where the heart of the home is with its kitchen and dining/living space. This has a wonderful country style to it and is excellent for everyday living. The lounge has a solid wooden burning stove and tiled floors, while the kitchen has a good range of high and low level units and access to the outside courtyard. There is a large boiler room with excellent storage with a utility room to the rear. Entered through a magnificent archway, the Courtyard has been renovated to an exceptional standard. The stonework and craftsmanship is superb and has been maintained throughout the years. The sheds have also been renovated to the same standard, complete with concrete floors. The large storage shed is currently being used as a showroom. On the first floor, the coach house mirrors equal superb quality and could be used for a number of commercial uses or as guest accommodation, subject to planning from the local county council. The lands are of excellent quality and have bred renowned horses and have first class facilities for both horses and cattle. An impressive American Barn offers eight loose boxes and large storage area for hay and machinery. A cattle crush is located to the side of the barn with a concrete area. The lands of approx. 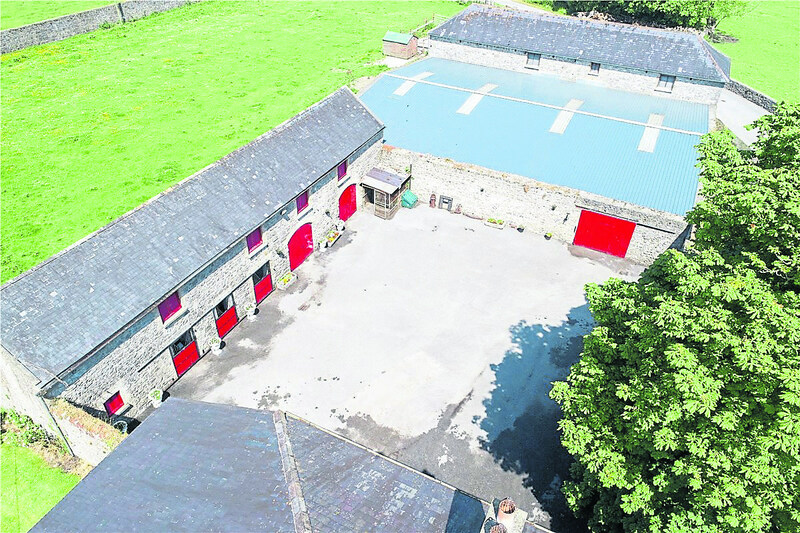 56.24/22.76 hectares, with their mature boundaries, are superb and very well maintained and are suitable for a number of uses including tillage and grazing. Cloneyhurke House at Portlarlington is for sale by Sherry Fitzgerald Hyland Keating with a guide price of €900,000.